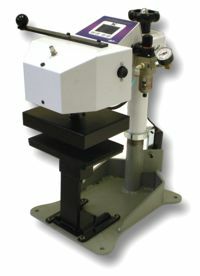 The DC8AP is identical to the DC16AP Automatic Digital Combo mulipurpose swing-away heat press, but in a smaller 6"x8" label size. The DC8AP features all of the interchangeability and design of the DC16AP, but in a smaller 6"x8" format heat platen and bottom table. This press is ideally suited for label printing, applying "tagless" labels to garments, embroidered patches, and any small pressing area where a large heat platen is not appropriate. The smooth automatic pressing and pushbutton activation provides a prductive, fatigue-free operation, and all of the attachments available on the DC16AP can be used on the DC8AP.